There are a variety of decorative styles of aluminum fencing. On top of choosing the ornamental options you desire homeowners also get to choose the color of the fence, the size and height of the aluminum fence panels along with special features such as puppy pickets. Aluminum fencing is like a buffet of fencing options. Below you will find a guide on styles and options to look for when choosing wholesale aluminum fencing for your home or business. There are several options within flat top styles of aluminum fencing. A traditional flat top rail fence is an incredibly classic option in aluminum fence. The top of the fence is flat however the actual spaces between the pickets and horizontal rails within the fence are spread out to offer a unique look and feel between the styles. The San Marino Classic is what homeowners would consider classic aluminum fencing. It is a stunning aluminum fence option with a contemporary three-rail design. This style of aluminum fencing is a top selling style and is seen as the perfect accent to landscapes and outdoor living spaces. Spear top fencing options seem almost endless. When looking at spear top options homeowners can choose from pressed point spear top options, historic Fleur de Lis finials and Excelsior finial peaks. Aluminum fencing featuring spear tops is considered decorative aluminum fencing. Not only can you choose the style of spear there are options to consider within the pickets themselves. The spacing between the horizontal pickets and ornamental add-ons make spear top fencing look like a piece of art within your landscape. Older more historic homes often choose the Charlemagne spear top fence. This style offers old world charm and tradition to landscapes. Accented with historic Fleur de Lis Finials, the Charlemagne is the ideal option for decorative aluminum fencing. If you are look for an option that includes both the flat top and spear points look no further the New Orleans Classic. This style of aluminum fence, as well as many others, can be customized with additional touches such as ornamental finials. The look combines traditional with contemporary favorites. The comfort of the flat top with the elegance of a spear top design is used to transform your landscape into a visual masterpiece. Choosing a style of aluminum fence is not a simple task. With endless options it can actually be a bit overwhelming. Let the online fencing experts assist you throughout the entire process. Working directly with online customer service specialists will ease the task. Don’t be surprised when asked to send pictures of your home, landscape and fence layout in order to ensure a complete customer service experience when choosing awholesale aluminum fence for your home or business. iFenceUSA offers a variety of maintenance-free, no-rust aluminum fences and gates in the industry! Whether you are a pool contractor, a building contractor, an architect, a landscaping professional, or a “do-it-yourself” homeowner looking for value and installation advice, you’ll benefit by buying aluminum fences shipped factory-direct from http://www.iFenceUSA.com! 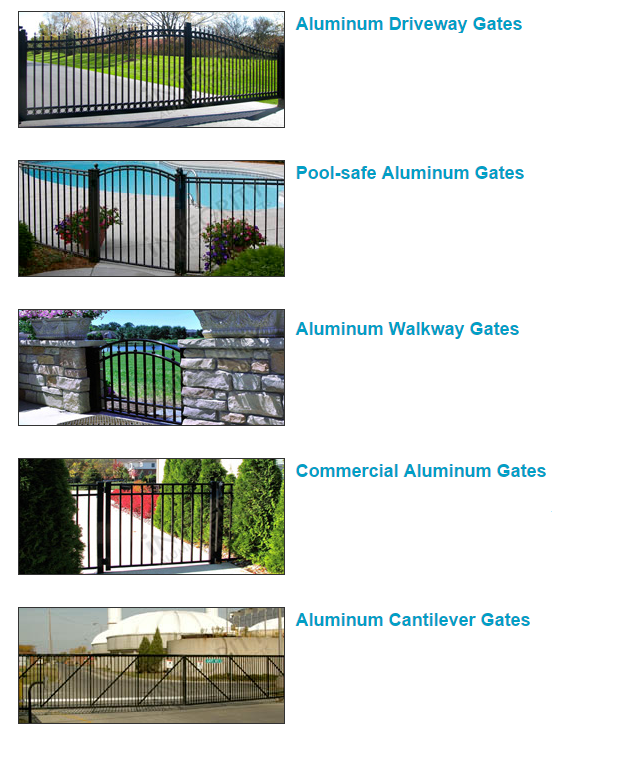 This entry was posted in aluminum fencing, comparisons to vinyl fencing, custom fence options, Driveway Gates, Gate Hardware and tagged aluminum driveway gates, aluminum fence, Aluminum fences, aluminum fencing, aluminum pool fencing, aluminum pool gates, aluminum swimming pool fence, metal pool fence, residential fencing, wholesale aluminum fencing on January 26, 2016 by admin. There are 18 standard styles of Integrity™ fences, and many options associated with them. All gates correspond to these styles and variations yet can be ordered independent of fence panels. To learn how to buy an aluminum gate, simply choose the type of no-rust metal gate you want and we’ll walk you through it! This entry was posted in Aluminum Gates, custom fence options, Driveway Gates and tagged Aluminum Cantilever Gates, aluminum driveway gates, aluminum gates, Aluminum Walkway Gates, Commercial Aluminum Gates, Pool Safe Aluminum Gates on January 13, 2016 by admin. Buying wholesale aluminum fencing can leave your head spinning. There not only are a variety of online suppliers to choose from as well as thousands of different ornamental styles, colors, grades and additional options to enhance your aluminum fence. Many consumers get overwhelmed when looking at all of the choices they have. This is where it becomes so important to choose the right online wholesale aluminum fence supplier. At iFenceUSA.com our professionals are in fact fencing experts; they are not just ordinary order takers. Our experts will guide you through the process of selecting the right fencing for your custom project. The first step experienced fencing experts will want to acknowledge is the special circumstances within the space your new fence is to be installed. Is the terrain especially sloped? Are there multiple hills to contend with? Are you looking to install a fence for pool safety? Is the fence being put in to keep children and pets within the yard? The first thing to address with a wholesale aluminum fence supplier is the special reason you have for installing a fence and the special circumstance surrounding the landscape terrain. After this has been accomplished you will want to choose the grade of fencing that you will install. Most wholesalers offer a variety of grades including residential, pool, commercial and industrial. Depending on what application the fence is going to be used for will help with this decision. For normal backyard, perimeter fencing residential grade aluminum will do. If you are looking for a pool enclosure you will need a fence that meets B.O.C.A. pool safety standards. Commercial grade fence is great for light commercial use and for upgraded residential use whereas industrial grade fencing is the strongest aluminum that can be purchased. Once the grade of fencing has been chosen the specifics of your layout will be discussed. The online design team will walk you through measuring your yard. From here a design of the landscape should be drawn with the measurements provided and faxed over to the wholesale aluminum fence supplier. A base quote will be established and from there you can choose a fence style, a color for the fence and the other optional features there are to choose from. The additional changes will increase the expense of the base quote. After a fence has been agreed upon the order will be placed and your fence order will be processed. The aluminum fence that has been ordered, as well as the accessories, will be shipped to your location and from there the installation process can begin. The relationship that has been established between you and the online wholesale aluminum fence supplier should stop here. Reputable online companies will offer advice throughout the installation process from prepping the work site and throughout the installation of the fence and gate. 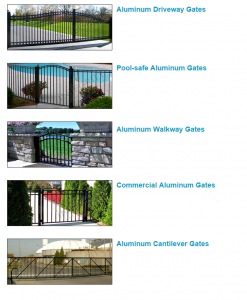 This entry was posted in aluminum fencing, custom fence options, Gate Hardware, metal fences, pet containment, pool safety, Wholesale Aluminum Fencing and tagged aluminum driveway gates, aluminum fence, Aluminum fences, aluminum fencing, aluminum pool fencing, aluminum pool gates, aluminum swimming pool fence, metal pool fence, residential fencing, wholesale aluminum fencing on January 5, 2016 by admin.